Stewart Edward White wrote fiction and non-fiction about adventure and travel, with an emphasis on natural history and outdoor living. White’s books were popular at a time when America was losing its vanishing wilderness and many are based on his experiences in mining and lumber camps. 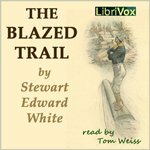 The Blazed Trail is the story of early lumbermen in the northern woods of Michigan. The novel portrays the challenges faced by the workers focusing on one, Harry Thorpe, as he endeavors to be successful though completely unskilled when he enters the woods. The author mixes the splendor of nature with suspense, danger, and romance and provides glimpses into corrupt practices in the lumber industry at the time.